hands should match the hour marks, yes, sooo is this a stylish franken or a rare exception? Or am I missing something else entirely? From what we have all gathered, do my fellow comrades feel that this one is legit aside from the lume dot on the bezel? In my opinion, yes, all legit with the one question mark being the lume pip on the bezel. But this could be original as well. Yeah, definitely an Amphibia. And as this is such a unique and special export variant, I'm not sure it's the best example to use for drawing far-reaching conclusions in any direction. great, thanks, glad to say the picture doesn't do the watch honour, as it looks much better in real life! so I take it then, there are -generally speaking- at least two ways for the hands to match the colour of dial marks? https://forums.watchuseek.com/f10/fra...eek-88091.html -- What's your point? 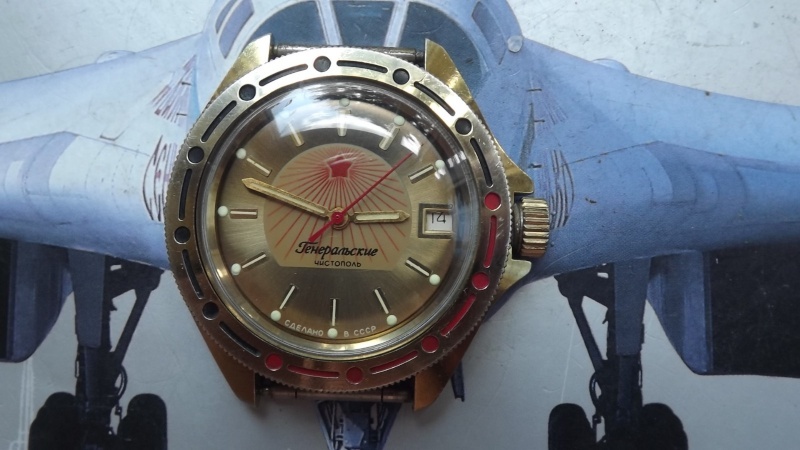 But last one, in my opinion, is definitely a franken: Generalskie dial/hands in the wrong case. Plenty of these examples exist, they're not rare (1, 2, 3, 4). 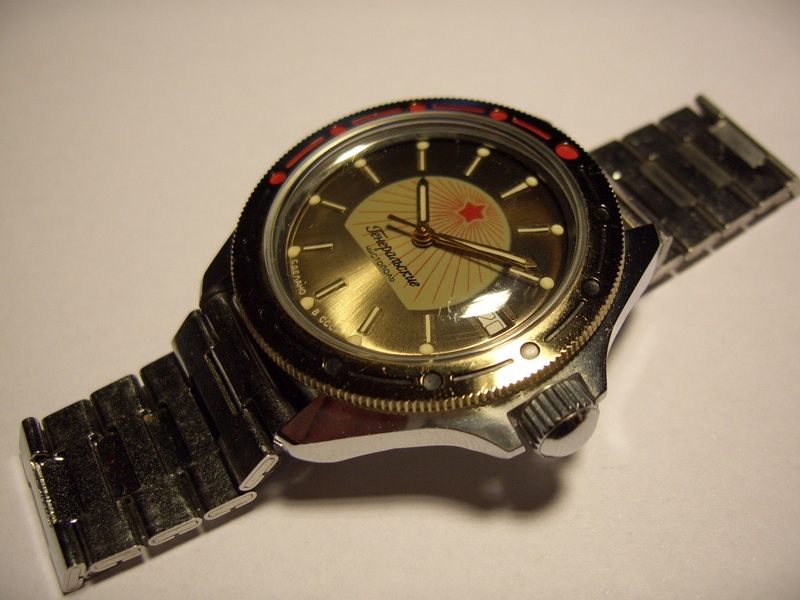 Perhaps an Amphibian version of this watch was also made, but then I would expect an arrow hour hand, wouldn't you? The Rising Sun is franken, too. Those black Amphibia hands have no business on that watch, in my opinion (1, 2, 3). I'll admit the other three look at least potentially legitimate, but they all share the same black Amphibian hands, which sometimes look out of place. So maybe they're all from the same era in Chistopol history when any sort of regulation and quality control went out the window. Or maybe Ivan was having a rough day. Or maybe they're all franken. Who knows. In the end, I would stress again that the features I listed could be considered "relatively firm principles" rather than hard-and-fast rules. I stand by my classifications thus far. Edit: Oh, and speaking of looking out of place, have a closer look at this one. Silver/white indices paired with jet-black hands? Reeks of franken to me. Last edited by mroatman; September 22nd, 2017 at 12:32. 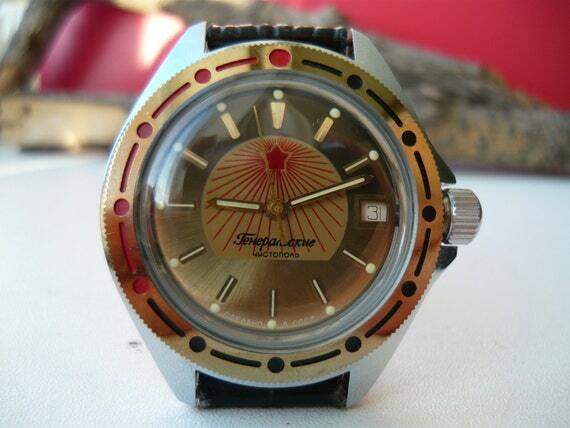 I hope I'm not leading you astray -- this isn't any kind of "golden rule" in the Soviet watch world. But as a general rule of thumb, yes, the hands should have some correspondence to the hour markers. This could be in color, material, luminosity, or general style. It's one of the things that makes well-designed watches appear, well, well-designed. The reason I included that one is that it has always been around in that form, an amphibian with that dial and straight hands (also straight second hand). There have been too many examples (this one in Michelle's collection, one of the most reliably authentic collections I've seen) over the years (I use to own one also) to be a franken, in my opinion, and I included it to illustrate that exceptions, at least to the hands, do exist. So, your generalskie compilation based on case style and material, backs, movement seems to work but, as often happens with Russian watches, some little detail such as the hands may exist in a form that can't be explained and shouldn't be dismissed, off hand, as a "franken" necessarily. Our "expectations" aren't always fulfilled completely. The Rising Sun "generalskie" was in your batch of pictured examples, by the way. Yes, I know, and I didn't mean to imply they were all perfect exemplars. A few have lumed bezels and flat crowns, too. But on the whole I think a pattern emerges. So, your generalskie compilation seems to work, but some little detail may exist that can't be explained and shouldn't be dismissed as a "franken" necessarily. Our expectations aren't always fulfilled completely.